Applications for the 2019 festival will be accepted from January 1, 2019-June 30, 2019. The votes are in and Nine Letters, written and directed by Linda Kash takes Peoples Choice at the 27th annual Cabbagetown Short Film Festival. Also attending the s0ld out screening at the historic Winchester Street Theatre Wednesday, September 5 were the films lead actors, Allegra Fulton, Ari Cohen and Megan Murphy, cinematographer, Colin Evans, editor, Stephen Parker and sound editor, Claire Dobson. Close behind in the voting were L'enfant Chameau, (Camel Boy), directed by Chabname Zariab and Andre the Anti-Giant, directed by Kim Saltarski. Many thanks to the Winchester Street Theatre staff for making the evening such a wonderful success. 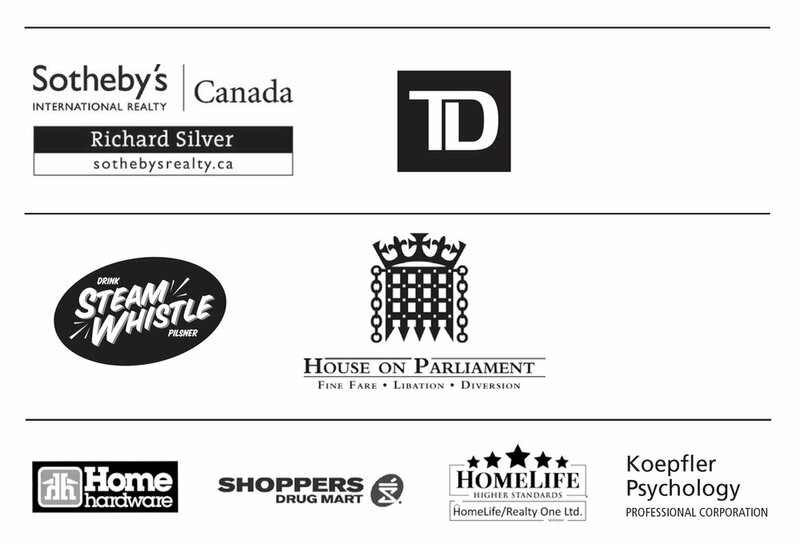 And thanks to our sponsors who made the event possible. 8 Films selected for screening at the 27th Annual Cabbagetown Short Film Festival, from the 14 shortlisted titles ~ 3 Prizes Awarded!!! The selection jury met on the evening of August 21 to review 14 shortlisted productions and select those to be screened at the one-night-only festival, as well as pick the festival award winners. Many thanks to all who submitted their work for consideration and to the shortlisted filmmakers for their outstanding work. On August 21, 2018 the Cabbagetown jury will select the final program and award winners from the shortlist. The selected titles will be screened on Wednesday, September 5, 2018 at the Winchester Street Theatre in the heart of Toronto, Canada. 5 Films About Technology Wins Peoples Choice! The people have cast their ballots and this year, a comedy has won their hearts and votes ! 5 Films About Technology not only takes home the Best Comedy Award, but also the People's Choice Award. The honour comes with $600 and was awarded to Director , Peter Huang. 15 Outstanding shorts selected from over 300 submissions from around the world! The 2017 Cabbagetown Short Film Festival jury selected the following shorts for screening at the 26th annual screening, Wednesday, September 6th at the Ada Slaight Theatre, Daniels Spectrum, 585 Dundas St. East , Toronto. Tickets are available online. Cabbagetown Short Film Festival now accepting submissions to the 26th annual festival! The 26th annual Cabbagetown Short Film Festival will take place on Wednesday, September 6th in downtown Toronto. Submissions will be accepted until July 31, 2017. Free to enter! See guidelines on the application page. Congratulations to the following talented filmmakers who received their awards on September 7th at Daniels Spectrum in the heart of downtown Toronto. THE VOTES ARE IN! - Motivational Quotes: An Addiction, starring Miles Verweel, directed by Alasdair Clarke and shot by Ben Ainsworth, takes the 2016 People's Choice Award at the 25th annual Cabbagetown Short Film Festival! This is the second win for the film, which won first place at the Cynecycle Film Fest VI in Toronto earlier this year! 14 SHORTS SELECTED FOR THE 25TH ANNIVERSARY SCREENING! Congratulations to the selected filmmakers and sincere thanks to ALL the filmmakers who submitted their work for consideration. We look forward to hearing from you again and wish you all the best in the future. 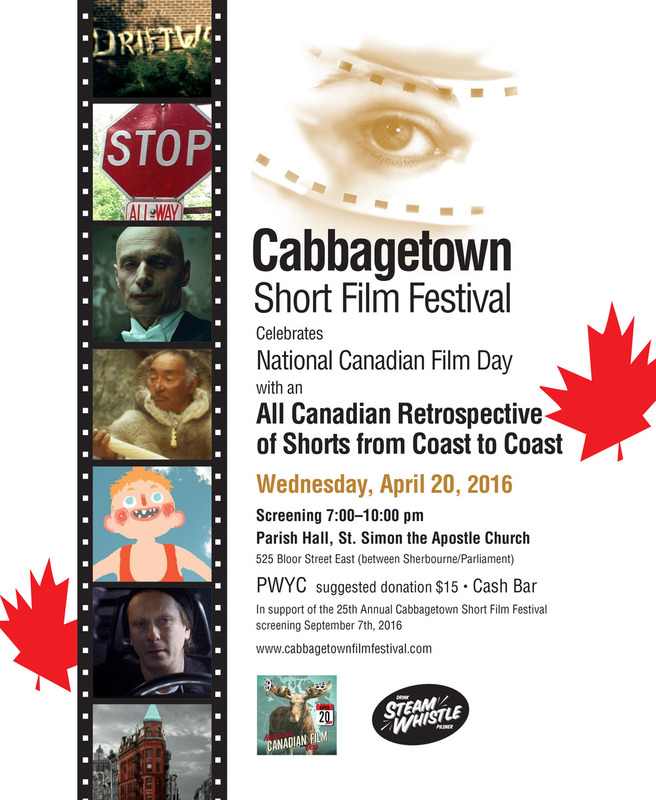 SAVE THE DATE: Wednesday, September 7th, 2016- 25th Annual Cabbagetown Short Film Festival ! The 25th annual Cabbagetown Short Film Festival will celebrate a very special anniversary on Wednesday, September 7th from 7:00-10:00pm with an all new program of exceptional short films at Ada Slaight Hall located in Daniels Spectrum, 585 Dundas St. East, Toronto. Don't miss this gem of a festival, which promises something for everyone, including fans of Drama, Documentary, Animation and Comedy! Don't Miss the Deadline for Submission to the 25th Annual Cabbagetown Short Film Festival! July 31, 2016 is the deadline for submission for this year's screening, at which we celebrate a quarter century of exceptional short films from around the world and around the corner! Don't miss our upcoming celebration of Canadian favourites from the festival archives! We'll represent Canadians from coast to coast to coast. Screening at the coolest venue in Cabbagetown, The Parish Hall, St. Simon-the-Apostle, 525 Bloor St. East, 7-10pm. Its PWYC, with a suggested donation of $15. Admission + Cash Bar will support the 25th annual Cabbagetown Short Film Festival, Sept. 7th! The Cabbagetown Short Film Festival will turn 25 in September 2016! To celebrate this special anniversary year, we will revisit some of our favourite titles from the past with several local screenings over the next few months. Join us for a Free one-hour screening of international favourites on March 4, 7-8pm at the Parliament Street Library. Please plan to arrive early as the seating is limited. Stay tuned for more news about our all-Canadian shorts screening coming in April.